Donald Trump yesterday was preparing to tell Kim Jong-un he would not be toppled as North Korea’s leader if he agreed to give up his nuclear weapons, as it emerged that Kim had set a deadline of Tuesday for ending the Singapore summit, prompting President Trump to move up his departure from Wednesday, as planned. 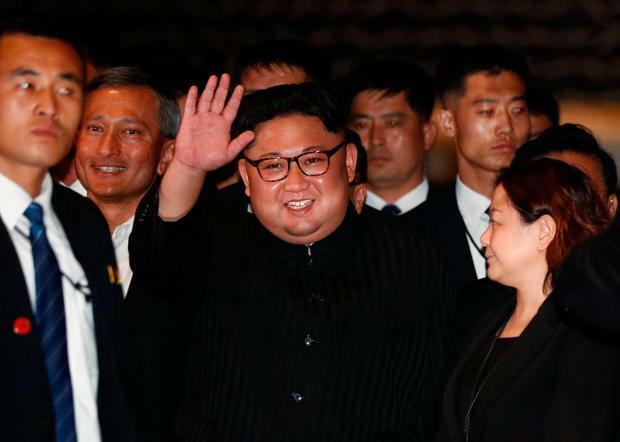 In an audacious bid to secure peace, the US president was due to offer “unique” assurances over Mr Kim’s safety in a face-to-face meeting in Singapore. Mr Trump was expected to propose a surge in overseas investment and the lifting of economic sanctions if Mr Kim agreed to denuclearise. However, he was also planning a stark threat – that the regime would be hit with even tougher sanctions if it rejected America’s demands. Mike Pompeo, the US secretary of state, conveyed the messages as he laid out America’s terms for a deal on the eve of the historic summit. Mr Pompeo said he was “very optimistic” the meeting would be a success but played down chances of an immediate breakthrough, framing discussions as the start of a process. Mr Trump was expected to initially meet with Mr Kim alone this morning, except for interpretors, to discuss the possibility of denuclearisation on the Korean peninsula. The US president said he would know within a minute whether the North Korean leader was serious about giving up his nuclear arsenal. The summit the first time sitting leaders from both countries have ever met and a remarkable turnaround from last year, when the pair were trading insults and threats. After one-on-one talks, a wider bilateral meeting with senior advisers from both sides was planned to take place, followed by a working lunch. The talks are being hosted at the luxury Capella hotel on Sentosa island – just off the coast of Singapore – and are expected to last much of the day. The meetings come in the wake of last weekend’s G7 summit as Taoiseach Leo Varadkar said Ireland “stands” with Canada and the rest of the G7 countries following the war of words that erupted between Mr Trump and Canadian Prime Minister Justin Trudeau. “Ireland is always on the side of free trade, it’s the reason Ireland has become a wealthy country. We stand with France, Germany, Canada and Japan,” he told journalists. The Taoiseach was speaking at the launch of ‘Global Ireland 2025’ – the Government’s plan to expand the State’s international influence in the wake of Brexit and America’s apparent slip away from it traditional alliances in the EU and elsewhere. At the same event, Tánaiste Simon Coveney also described today’s meeting between the North Koreans and the Americans in Singapore as “deadly serious”. “We’ve spent a lot of time at the Foreign Affairs Council in the European Union trying to understand how the EU could be supportive of a peaceful transition of the Korean Peninsula,” he said. Meanwhile, Mr Pompeo yesterday gave the clearest outline yet of America’s position as he described the incentives and warnings Mr Trump would deliver to Mr Kim. “The complete, verifiable and irreversible denuclearisation of the Korean Peninsula is the only outcome that the United States will accept,” he said. Mr Pompeo added: “President Trump recognises Chairman Kim’s desire for security and is prepared to ensure that a North Korea free of weapons of mass destruction is also a secure North Korea. US and North Korean officials held negotiations in Singapore yesterday in a bid to close the gap between both sides. A White House spokesman cites the fact that the talks had “moved more quickly than expected” as the reason for the tight window for the meetings. However, the North Korean leader set a deadline of Tuesday for ending the summit, prompting President Trump to move up his departure to Tuesday instead of Wednesday as planned, Bloomberg News reported last night. Citing two U.S. officials familiar with the planning, Bloomberg said Trump had been willing to stay longer if negotiations were progressing, but since Kim set definite plans for departure, so did Trump. The US wants sanctions to be lifted only once North Korea fully denuclearises, while Mr Kim’s officials have voiced a preference for benefits to be phased in. 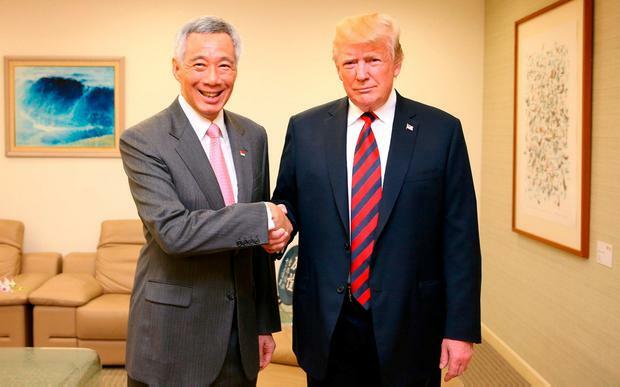 Mr Trump met the Singaporean Prime Minister Lee Hsien Loong, thanking his “professionalism” in the summit’s planning and expressing hope things could “work out very nicely”. Mr Kim, who like Mr Trump flew into the city-state on Sunday, was not seen for much of yesterday but his motorcade was spotted out in the city. North Korean state news announced the meeting yesterday – the first time the country’s people had been told Mr Kim’s summit with Mr Trump was definitely going ahead. Next articleHow did everybody cope with the World Cup’s mammoth four-game Saturday?